In patients with gastroparesis, whether diabetic, idiopathic, or postsurgical, pyloroplasty remains an excellent treatment modality. Pyloroplasty allows for effective treatment without precluding future treatment modalities such as gastric stimulator implantation and gastrectomy. 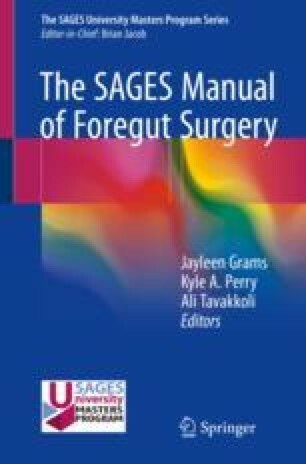 The authors’ preference is to perform the procedure laparoscopically in a Heineke-Mikulicz fashion, using 2–0 absorbable suture. It is our practice to confirm an airtight closure at the end of the operation, using upper endoscopy to confirm. While suture line leak is the most worrisome complication of laparoscopic pyloroplasty, the incidence of this is low. The literature supports an overall low morbidity, in addition to subjective improvement in symptoms. Recent studies have demonstrated significant decreases in the T1/2 on postoperative gastric emptying scintigraphy. Laparoscopic pyloroplasty provides a safe and effective treatment modality for gastroparesis.